A pregnant school teacher, mother and two children were among the lucky victims rescued from the scene of the building collapse. However, they sustained degrees of injuries and were rushed to the hospital for medical attention. The Pashi Willoughby CDA executive member, Kazeem Lawal, could not make it as it was learnt that he just returned from his night duty as a security guard and was in his room sleeping when the incident occurred. His body was brought out and taken to the General Hospital mortuary, Lagos Island. 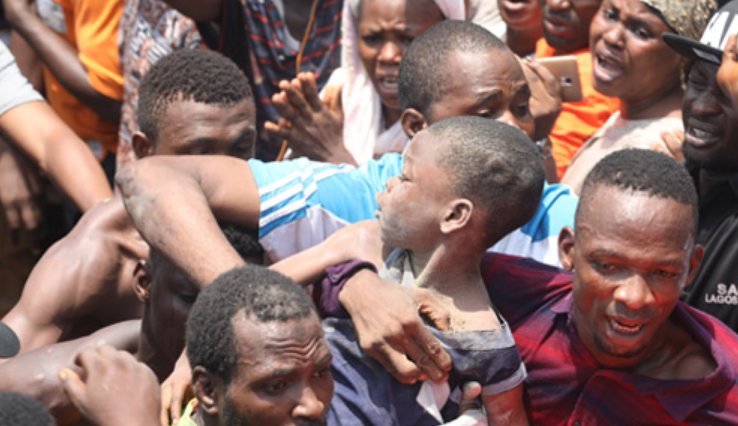 A barber, Mr. Adeyemo, also lost one of his twin daughters to the incident as the first to be rescued survived the incident. Ambulances from nearby areas were used in carrying the rescued victims while officials of state Fire Service, security operatives, Lagos State government officials worked together with street urchins on the rescue mission. A heavy crane, belonging to Julius Berger, was also brought to scene to assist rescuers.